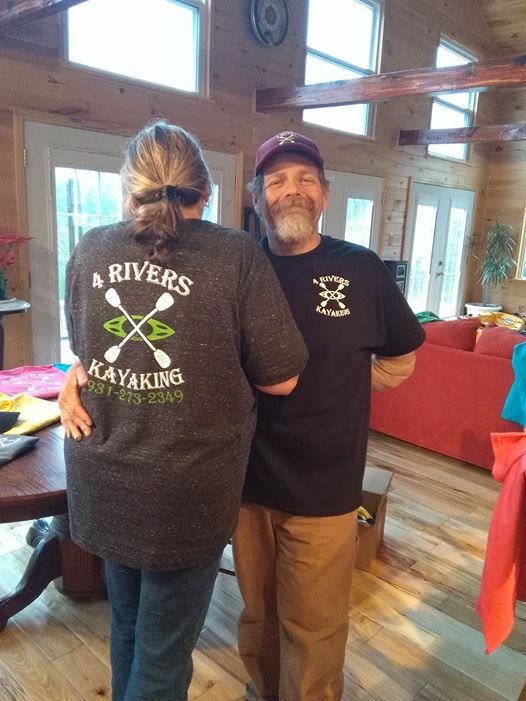 The whitewater is so good along the rim of the plateau, former Olympic kayaker Eric Jackson moved to Sparta and opened Jackson Kayak; he has since become one of our largest employers. 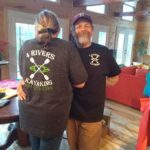 From the Class V whitewater froth of the Upper Caney Fork, to the mild flat water along the Calfkiller River there are streams here to suit every skill level. If you are a kayak fisherman, adding the shoreline of the three lakes that pass through the highlands, gives a greater length than the entire coastline of Florida. The Chamber of Commerce sells a map which shows the proximity of the rivers to the roads making launch and retrieval a breeze. You can spend hours or days on these rivers; overnights are recommended. Upper Calfkiller: Multiple access points are available along State Hwy. 84 running from Monterey to Sparta Tennessee. 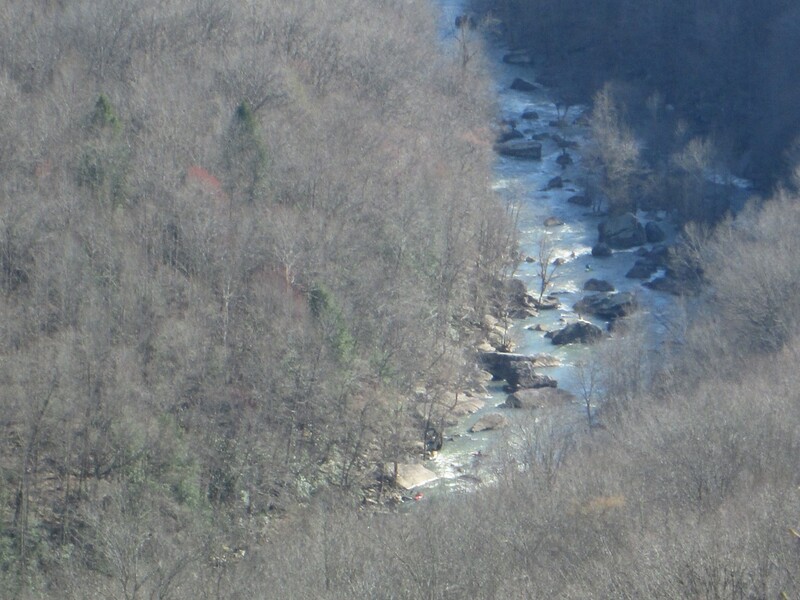 During winter’s high-water, you can put in as far up as Mill Creek in Putnam County. 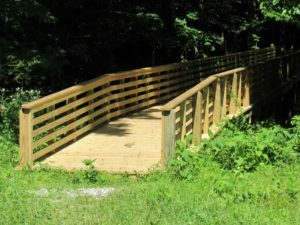 Year-round access is viable starting at the White County line on 84 and heading South, though some portaging will be necessary during dry seasons. Expect easy paddling and mainly gentle currents along the way. The cool cave-fed river takes you through remote forests and pastoral farmland. Abundant wildlife will almost always be seen. There are several locations where small waterfalls and springs pour over bluffs into the river. This is a truly scenic float, but be prepared; you may not see another human being for hours at a time. Middle Calfkiller: FUN, FUN, FUN, flatwater. The best access point is from the wildlife ramp on the South end of Church Street (pictured) in downtown Sparta. You can paddle upstream under Bockman Way all the way to City Lake Dam. You can paddle downstream to the power house dam at Hwy. 111. Be aware that both of these are low-head dams and when they are in sight, you are close enough; low-head dams can be dangerous. The launch ramp has a picnic shelter, or you can pull out at the Bockman Way (Hwy. 70) bridge and walk to several restaurants, galleries, etc. in the historic downtown section of Sparta. 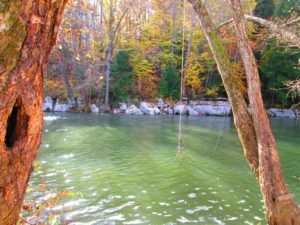 Caney Fork River Headwaters: Class V Whitewater. While this is a favorite run for the most experienced kayakers and attracts paddlers from all over the world; one kayaker summed it up “you can do it once, you can do it twice, but if you do it consistently, you will be killed.” You loose about 500′ in elevation over 5 linear miles along this stretch, as the Caney Fork drops off of the Cumberland Plateau. The picture is taken from Yellow Bluff in the Bridgestone Centennial Wilderness Area, if you look closely you will see a red kayak that has descended over 400 feet by the time he got to this point. Weary paddlers generally pull out at the intersection of the Caney Fork and Bee Creek at the end of Scott’s Gulf Road. 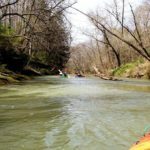 Let the paddler beware. . . .
Caney Fork River, Scott’s Gulf Section: Running from the end of Scott’s Gulf Road to Big Bottom. During the majority of the winter months this stretch is Class II and III whitewater. 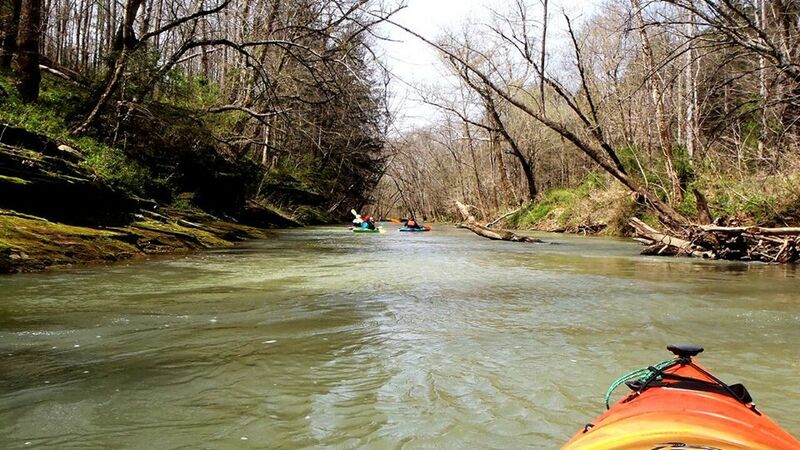 Sixty percent of this county drains through cave systems, during the summer, the Caney Fork disappears and reappears several time along this stretch; in the summer, this stretch can be a 7-mile long portage over river rocks that are as slick as silicone. 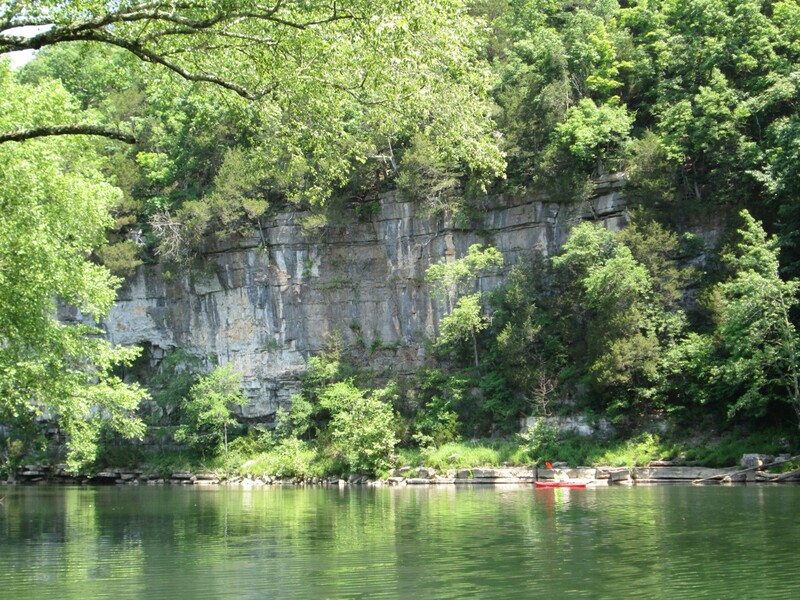 Even during the summer, there are three beautiful natural pools known as The Fork Hole, Amber’s Den, and The Ford Pool that are worthwhile flatwater paddles. While advocates maintain the run is spectacular and worth it I have seen the remains of many a shattered kayak and canoe along this section. In some spots, rescue would be near impossible. Again, let the paddler beware. 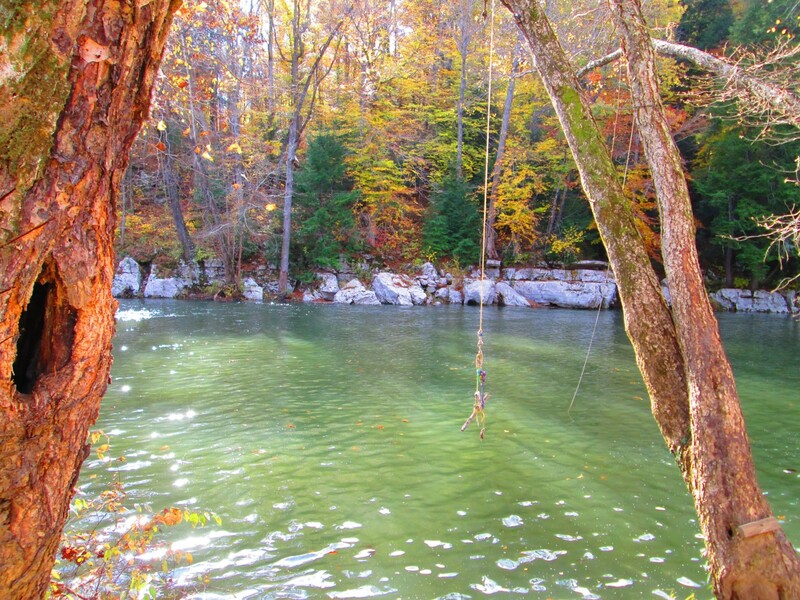 Caney Fork River: Frasier Chapel Bridge to Plum Lee Ford. The most recent addition to our paddling paradise has barely moving water followed by a 400′ portage and then into more barely moving water or the backwater of Rock Island Dam, depending on the time of year. This is a comfortable five-hour trip of lazy paddling through some peaceful countryside. 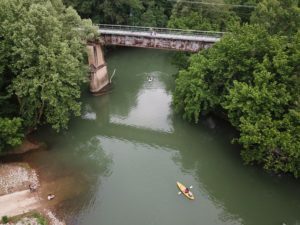 You will see limestone cliffs along the first part of the paddle, abandoned highway and bridge ruins along the middle, and beautiful homes surrounded by river shanty’s toward the end. This is an easy float in a canoe, kayak or john boat. The beginning point is a parking lot just east of Frasier Bridge. 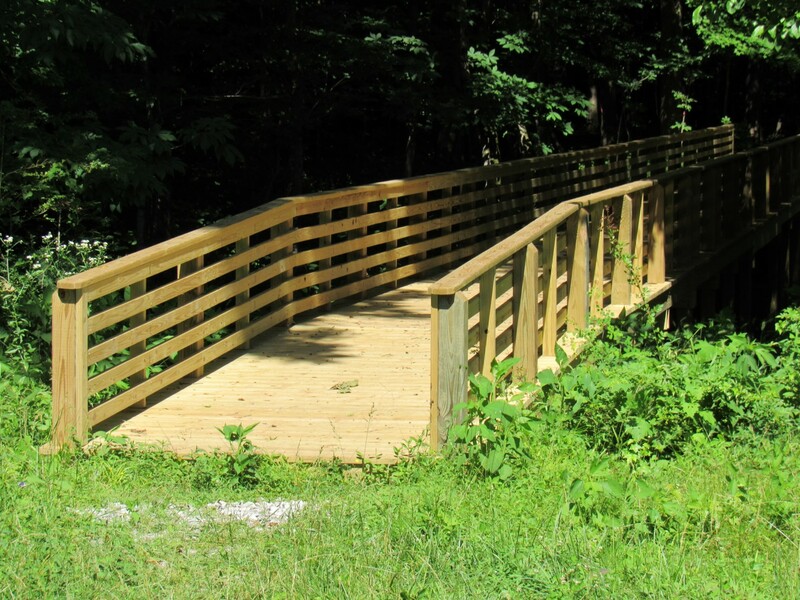 There is a Mennonite-built foot bridge to get your boat across a deep gully and to the water’s edge. This is not the easiest launch, but worth the trip. Enjoy.